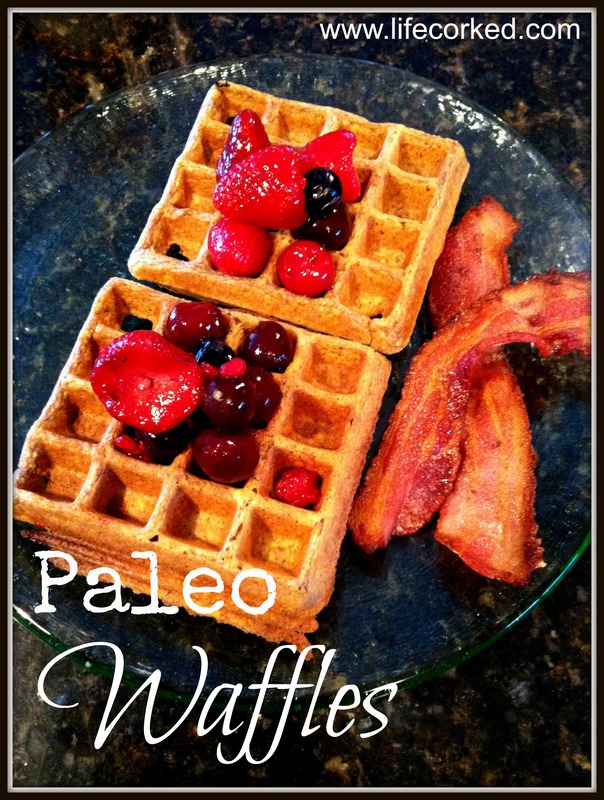 Paleo Waffles – That Taste Good! Today, marks Day 2 of my “healthy eating-but tastes good” series! I don’t know about you, but I LOVE waffles – and so does everyone else in my family! Both my husband and I grew up with waffles and our kids have now become waffle converts. I’m not a big pancake person (unless they’re my dad’s which are made in a cast iron pan with lots of butter), but I’ll take a good waffle any day (usually on the weekend with a big ol’ cup of coffee!). And, just like the Paleo granola I featured in my last post, my husband’s aunt introduced me to these seriously scrumptious Paleo waffles. Originally, a Paleo pancake recipe from The Paleo Mom, she tried them in a waffle iron and they turned out great! The key ingredient in these are plantains, which sounded pretty strange at first, but provide the perfect texture for the waffles. Not every grocery store sells plantains, but I did find them at my local WinCo. Typically, any large grocery store will have them so just call around before you go shopping. I like to put fruit on anything I can, and these are especially good with fresh or frozen berries. Costco sells a wonderful organic frozen berry mix that I love. Just put some in a bowl and defrost them in the microwave and they’re ready to go. Top it off with a little maple syrup and a side of bacon – and you might become a Paleo waffle convert too! Peel plantains (I find it easier to quarter them before I peel them) and place pieces in your blender or food processor. Add the rest of the ingredients to the blender or food processor and process until it forms a smooth batter (about 1-2 minutes). Spray waffle iron with cooking spray and poor batter into waffle iron. Let cook 4-5 minutes, or until golden brown. Repeat with remaining batter, adding a little more cooking spray as needed. One batch of batter will typically serve a family of four, however, if you have big eaters or want leftovers (they’re great heated up in the toaster), I would suggest making two batches. I can’t believe these are paleo; they look too delicious to be healthy!! Thanks for sharing! They’re pretty good – and worth the time! Thanks for stopping by! Thank you! And, thanks for stopping by! These are so amazing, I thought I’d never eat another waffle as flour makes me sick in a way that would be good in a horror movie… so thank-You so much! I’m so glad you liked them! They’re a little labor intensive, but so worth it!